Morning ladies today I thought it would be fun to look at a brand I've featured a few times on the blog but not in any great detail & that's Finery. A brand who's ethos is to make 'modern, inspiring & sophisticated accessible without compromising on quality'. For those of you who've not heard of the brand they're actually celebrating their second birthday this month & in honour of the occasion have an amazing competition you can enter where you can win free clothes for 2 years, see here. I've actually bought a few items from them in the past & also tried on other pieces that I decided to return & I have to say I've found the quality & design to be spot on. The only slight negative for me is that sometimes I find their styling is a little more adventurous than my own personal style but if you're able to see through the styling & break it down into the clothing featured there's actually some really stylish, understated pieces that have that extra detailing I love. With this in mind I thought today I'd pick out my favourite pieces from their latest collection to share with you. 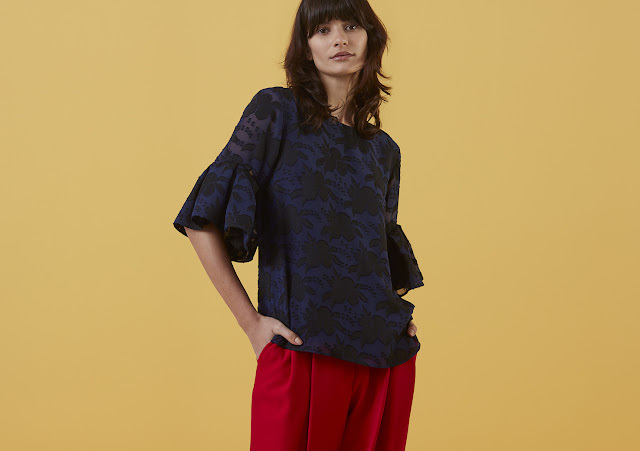 Starting with the stunning burnout frill sleeve top above. This features lots of things that I love including the frill detailing & the mix of navy & black & would look so elegant teamed with cigarette pants & a classic heel. As I've mentioned in past posts I have a love of clothing that's generally quite plain but that has that extra detailing to make it stand out from everything else on the high street. So I probably don't need to explain why I've featured the sleeve detail tie jersey top above. Or even this simple grey sweatshirt with cuff zip detailing below. 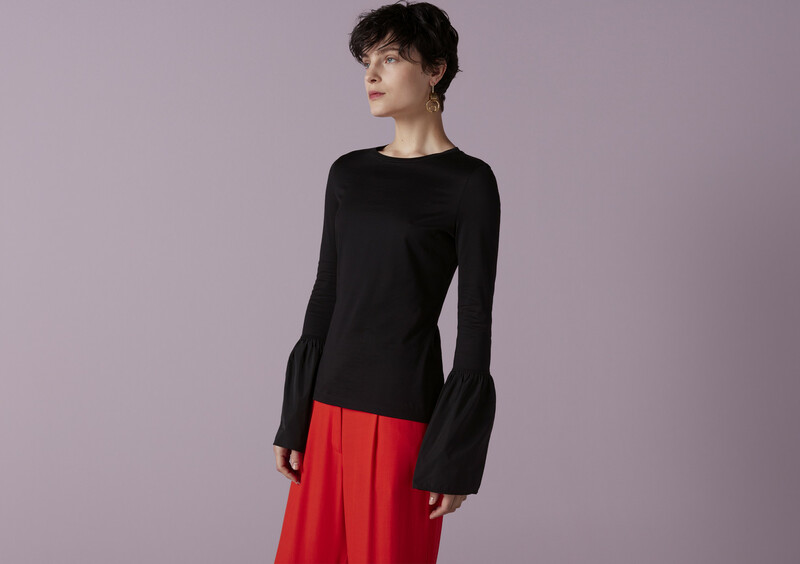 This fluted sleeve jersey top is also another beauty. Imagine this paired with a simple black leather pencil skirt or cigarette pants - timeless & elegant with a little extra detail to lift the simplest & plainest of outfits. Likewise this volume sleeve jumper. Now my affair with kick flare trousers started in earnest just before Christmas & if I didn't already own a black pair I'd definitely be investigating the above ones further. Imagine paired with a biker jacket & trainers or dressed up with ballet pumps & a blazer. Back to frill detailing again with the above frill hem shirt dress. I just love the idea of teaming this with a statement necklace, with the sleeves rolled up & the collar half turned up for a little more style. And this stripe wrap dress teamed with a biker jacket & minus the jeans. I also think this wrap jumpsuit would look amazing paired with some ballet flats & a biker jacket. I'd also perhaps try rolling the trousers up a little & stand the back of the collar up. 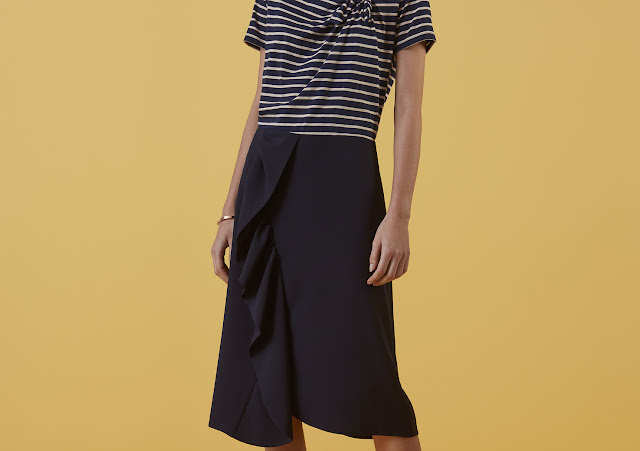 Again further frill detailing with the above skirt, which puts me in mind of a Zara navy version I bought at the beginning of the season. 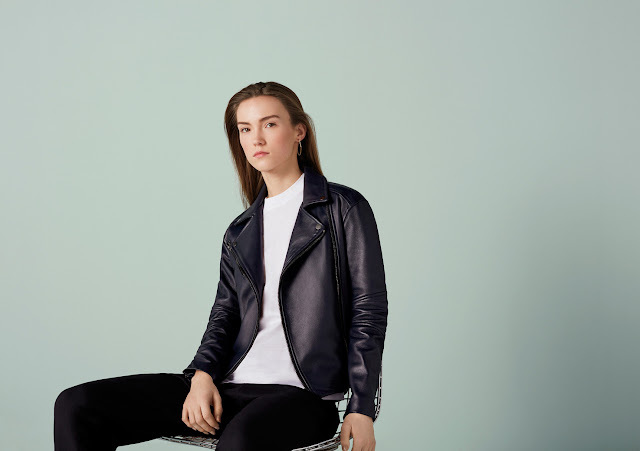 And as for this navy leather biker jacket - it really is a wardrobe classic & for anyone who owns a black version & wonders if they need a navy one in their life - yes you do! I've found my navy leather so useful & it's that little bit softer to wear than a black version. Finally finishing with a couple of items that are now hanging in my wardrobe after 'clicking that button'. Firstly this tie detail jersey dress that is made from a great weighted fabric that is so easy & comfortable to wear. The tie detailing is extremely flattering & the difference in hem length just adds that little bit of interest. You can see a quick picture of me in mine below, which I've not accessorised as I wanted to show you how stunning it looks just worn on it's own but you could easily add some statement costume jewellery to create a different look. I've also turned up & rolled back the sleeves a couple of times to give a more casual feel. And finally the last item I wanted to show you, I'm actually wearing today. As you may have noticed I've developed a real love for skirts this season. So when I spotted the one below I thought it would make a great addition to my collection, not to mention be ideal for dressing up or down. So ladies what are your thoughts? Anyone a fan of Finery or is it a brand you've looked at but never been sure of how to style? I'd love to know if you've spotted something in today's post that might just get you 'clicking that button' or made you want to investigate the brand further. 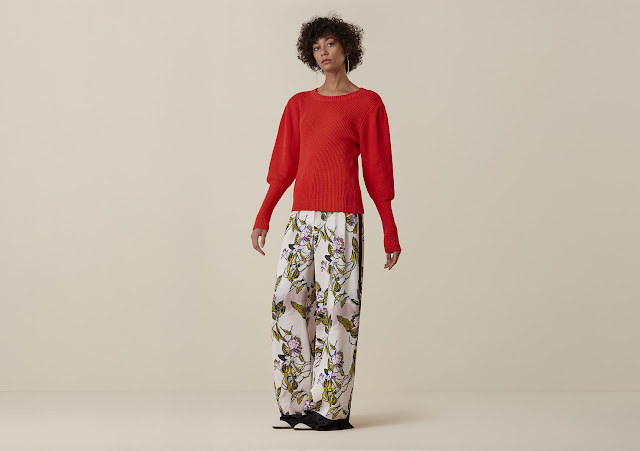 Finally Boden have just launched 20% off everything here, just use code 6T2C at the checkout & for inspiration you can see my edit from their latest collection here. Both dress and skirt--Gorgeous! Especially love that dress though!! Aww thanks Susan :-) It really is a beauty & perfect for dressing up or down.